6 Bathroom Renovation Tips from Professional Contractors | renoWOW! When it comes to renovating a bathroom, most people fail to realize that creating a beautiful space helps to enhance the overall value of your home. It is a perfect opportunity to design and build a private space that reflects your ideas and personality while delivering the comfort you need. Being one of the leading bathroom renovation contractors in Toronto, we have put together this guide to help you consider and finalize the essential aspects involved in a remodelling project. Before choosing a bathroom renovation contractor to work with, the first step towards remodelling your bathroom is to have a discussion with your family members. Talk about the essential factors such as the fixtures and layout of the area. Then determine the budget and remember to set aside a little extra so you can cover the cost of any unexpected changes that may occur during the renovation process. Once you have an idea of what needs to be done, determine the layout of your bathroom. A standard space usually has a sink, toilet, and bathtub along with a cabinet for medicines and toiletries. In addition to these fixtures, you could have other features according to your needs, such as a separate shower area. No matter what additions you choose to have, keep the plumbing fixtures close to the existing plumbing. This will make things easier and reduce costs. When designing your bathroom, choose the lighting features wisely to make sure that the room gets enough light. 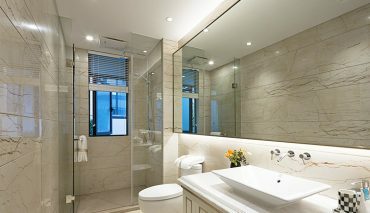 In addition to the overhead lights, you could also have fixtures around the mirror or vanity and in the shower. Consider waterproof lights and pendant lighting that compliment the style of the room. You could have a clutter-free bathroom by incorporating shelves, drawers, and cabinets according to the area available. If you have a small space, try creating a system of shelves with drawers and have baskets and a towel rack. Remember to maximize the available space according to your needs. When it comes to choosing a colour for your bathroom, keep things light by selecting neutral hues. Add a splash of colour by using baskets, towels, and accessories in vibrant shades. You could also have small potted plants to add a touch of green to your space. Most bathroom renovation contractors believe that flooring is an essential aspect of bathroom renovation. Ceramic, porcelain, and stone tiles are popular choices that are water resistant and pleasing to the eyes. Many people also choose baseboard tiles because they are durable and add an elegant finishing touch. renoWOW! 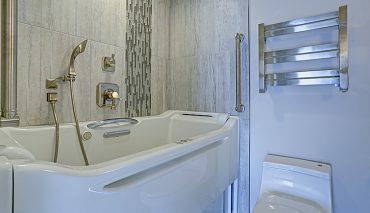 is a prominent bathroom renovation contractor in Toronto. We strive to provide our customers with a hassle-free, luxurious bathroom renovation. We have a team of skilled experts who can create a space that suits your needs and budget. We understand your requirements and will come up with the best possible solutions to help you create a beautiful and elegant space. You can trust our professionals to complete the project on time and deliver results that exceed your expectations. For more information about our bathroom renovation services, get in touch with us by calling 416-937-0969. You could also fill out our online form to get an estimate.